We would like to congratulate Masters Gallery Foods on their prestigious award “Sheboygan County Economic Driver of the Year” presented by the Sheboygan County Economic Development Corporation (SCEDC). The award was presented at the SCEDC’s Annual Meeting on November 14th, 2018. 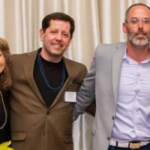 Jeff Gentine, CEO of Masters Gallery Foods, accepted and dedicated the award to more than 800 associates employed by Masters Gallery Foods, as well as customers and suppliers integral to the success of the company. “The ‘Sheboygan County Economic Driver of the Year’ Award reflects the family-owned firm’s economic impact to the region. The company’s growth plan has seen them expand from the City of Plymouth to the Village of Oostburg, supplying hundreds of family-sustaining careers and providing generous support to local nonprofits and charities.” For the full article, please click here. Learn more about the “Sheboygan County Economic Driver of the Year” award winner, Masters Gallery Foods, by watching the video below. Congratulations Masters Gallery Foods, you make Sheboygan County proud!